Two new cities just made the top 25 list of Ontario's most rat infested cities and it doesn't look good for the GTA. We now know the disturbing truth about which cities in Ontario are the rattiest. 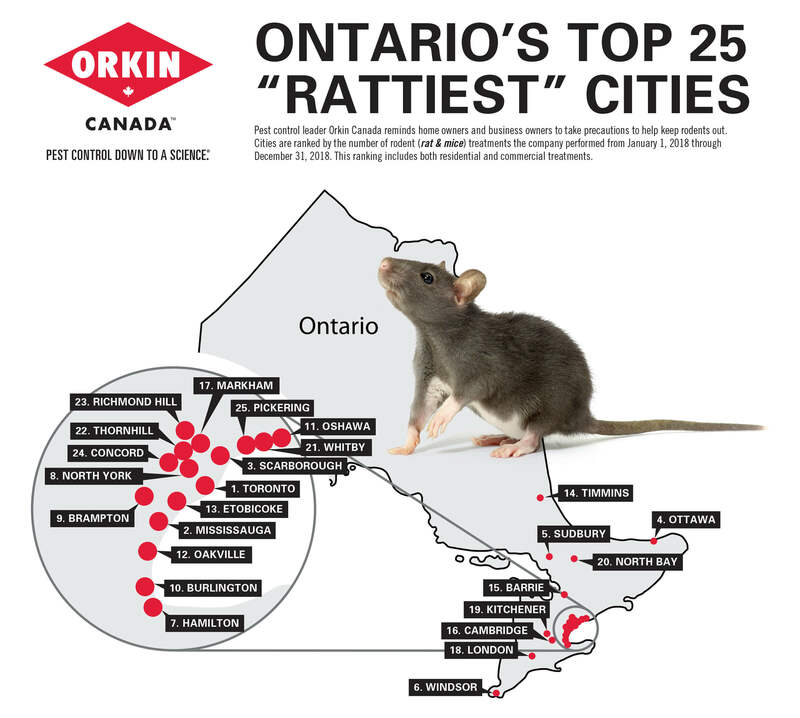 The pest control company Orkin has released their list based on how many rat and mice calls they responded to in 2018 and this year, two new cities made the top 25 list of Ontario's most rat-infested cities. There were major changes in the list from last year and it's not looking good for the GTA. Starting at the top of the list, it's no surprise that again this year, Toronto is holding first place for most rats. What's unfortunate for the GTA, is that while last year's second place went to Ottawa, they have been bumped down to fourth. This year they were replaced by Mississauga, followed by Scarborough. Other Toronto area cities are climbing in the rankings too. For example, North York held steady in eighth while Brampton rose two spots, cracking the top 10 in ninth place. Then there are the new cities that made the list this year, and as you may have guessed both of them are in the GTA. This year, those cities are Whitby, coming in at 21st and Pickering coming in at 25th. This is not good news for those cities, but it makes it even worse for the east end, where Oshawa also climbed one spot on the list to 11th. Some other cities outside of the GTA also saw some unfortunate growth when it comes to the number of rat infestations. Sudbury was the worst of all, moving up five spots to come fifth this year. Barrie and North Bay also moved up five spots coming in 15th and 20th, respectively. It's not all bad news though. There were three cities that fortunately made their way off the top 25 list this year. St Catharines, Niagara Falls, and Sault Ste. Marie all had low enough numbers of rat calls to not earn a spot on the list. The rankings are based on the number of rat and mice calls Orkin responded to in each city between January 1, 2018, and December 31, 2018. The calls include both residential and commercial infestations.